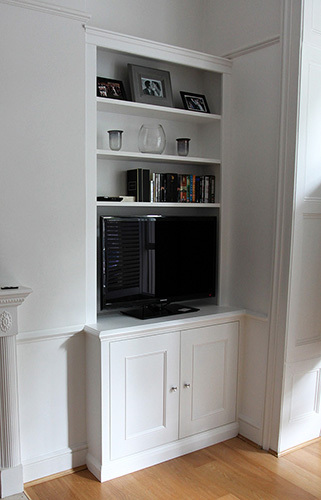 When working with JV carpentry its impotent to remember that we do have a set of process for the construction and installation of every fitted furniture project we work on. We stick with these proven processes because they can produce better quality results. If you found something you like in our Photo gallery please indicate the number shown in the left corner of the picture. 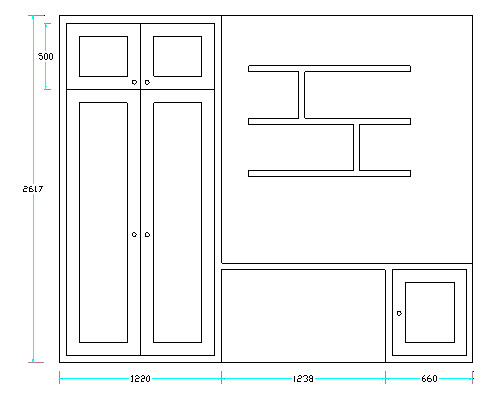 If you have an idea for a fitted furniture piece that we have not taken on before, please sketch some of the details in a rough format for what you may have in your mind. 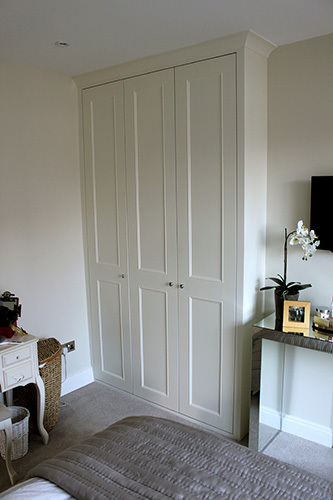 Even just sending us a link with the image of a similar style bespoke shelving unit, cupboard or a fitted wardrobe from a different website, and the width and height of space can be extremely helpful in determining the budget for a project we have never taken on. Once we have basic information about the type of project you would like to create, we can start to prepare a rough quote for the design and installation of the new furniture item. We will send a rough quote back to you and if the quote suits your budget, we can arrange a home visit to take measurements. We are available for home visits at almost any time to suit your schedule. We can show you some ideas from our portfolio as well as discuss how you would like to use the space effectively. After our on-site interview and measurements we will provide a final quote for the cost of the project. If you would like to proceed we will send you the drawings so that you can contact us with any changes you might want to make. We normally sending the drawings 10 days prior installation to give you some time to think if anything you would like to amend. After accepting the drawings we will fully prepare and cut materials in our workshop to arrive on site at a predetermined date. We start work on site at 8 AM in the morning and we can assemble furniture pieces, while taking full care and attention to protect the environment we working in. We will bring a wide array of protection cover for the floor, carpet and your furniture, as well as a professional vacuum cleaner. We have to perform light adjustments and cutting material during installation to adjust pre-cut pieces to the level dimensions of your home. 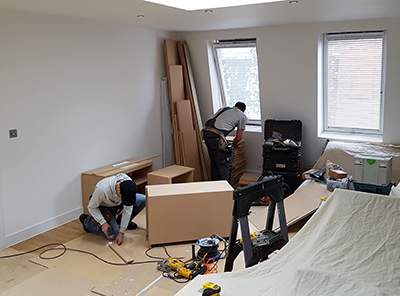 The walls are never straight in London's properties and unfortunately we need to do some cutting on site during installation of our fitted furniture. Depending on the size of the project, we can complete most installation services within 1 to 2 working days. 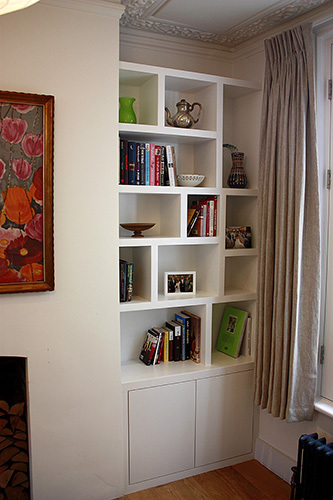 Our crews work as efficiently as possible to perform installation our furniture items. The day after installation we will perform the painting process. Our painter will arrive with proper dustsheets and clean-up items. Occasionally there will be a gap of 1 to 3 days between the woodworking process and painting. This will depend on the painter availability. 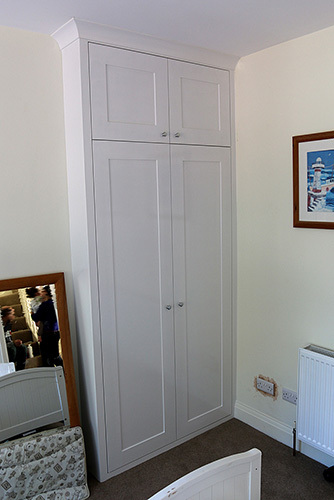 We do not offer off-site painting services and the painting process always takes place after installation. 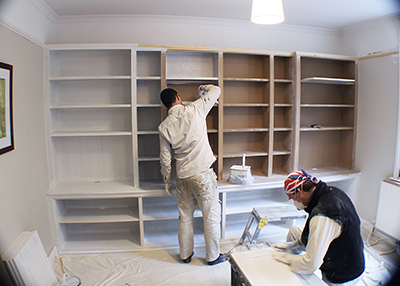 Our professional painters start their work with painting preparation - filling small gaps and screw/pin holes with wood filler and decorating mastic then sand down the corners and edges of the shelves then they apply at least three coats of paint to our MDF fitted furniture. They sand down all painted surface between each coat to improve finish. The painting and finishing process requires care and detail and three coats of paint. This process normally takes between 3 to 4 days depending on the size of your furniture project. Please note that we do have minimum spend rule and we might not be able to help you for example to install a few floating shelves. Thank you for understanding. Marvellous Job - thank you! This is the first time I used a company without a personal recommendation, but having read so many of the positive reviews, and being able to see the gallery of photo, I thought I would take a chance. I am so very glad that I did. Every interaction with Jeff and his team was incredibly professional, from first visit, to design, and then on site doing the construction and painting work. 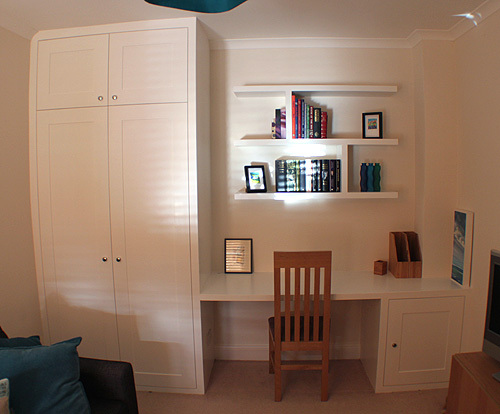 I am incredibly happy with the outcome - even better then I had imagined the wardrobes and shelves would look. Thank you Jeff - I would have not hesitation recommending JV Carpentry and i will certainly be using your services again.